2.1 What is bearberry and what is it used for? 2.2 What are the contraindications of bearberries? 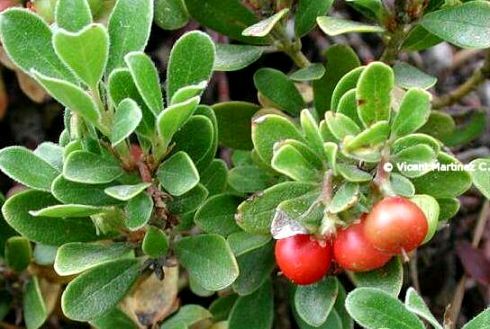 What is bearberry and what is it used for? Bearberry (Arctostaphylos uva-ursi) is a perennial plant of the Ericaceae family. In natural medicine, we use the leaves of this plant. They contain anti-inflammatory, urinary antiseptic (Arbutin) and astringent (very rich in tannins) substances. Bearberry is very rich in arbutin, a component with diuretic properties (for natural treatment of fluid retention) and with antiseptic and antibacterial virtues, especially to treat urinary tract infections (effective against Candida albicans and Streptococcus spp.). The contraindications of this plant are due to the high tannin content it contains. Prolonged use may cause alterations in the liver. What are the contraindications of bearberries? – It should NOT be used during pregnancy and breast-feeding. It can cause birth defects, lack of blood supply to the fetus, or induce premature labor. Neither should be used with children. – Children under 12 years: Bearberry treatments are NOT recommended in this case because it can cause liver problems. – Long treatments are contraindicated with this plant (no more than 7 days), because the richness in tannins it contains can cause liver failure in the long-term. – Liver disease: bearberry is contraindicated in liver disease because it contains hydroquinone (initially toxic to the liver) and rich in tannins. Avoid taking bearberry if you have cirrhosis, hepatitis, liver failure or other liver disorders. * More information on the toxicity of bearberry in the listing above. – Constipation: because of its tannin content, bearberry treatments can aggravate constipation since tannins are astringent. – Iron deficiency anemia (iron deficiency) people with anemia should not take long internal treatments with bearberry . Tannins inhibit the absorption of iron from foods, supplements, or medications. More information about bearberry in the listing above.